1. Preheat oven to 220°C/425°F/gas mark 7. 2. 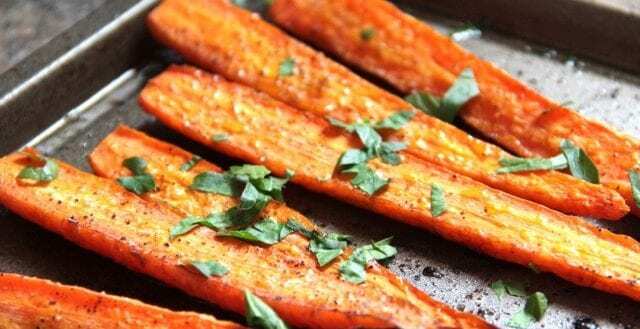 Place the carrots round side down side-by-side on a baking sheet. Season with salt, pepper, and nutmeg. 3. In a small bowl, stir together the balsamic and brown sugar until combined. Add the olive oil. Drizzle the whole mixture over carrots and toss to coat. 4. Roast for 25-30 minutes, or until carrots are crisp-tender and caramelised (cooking times can vary depending on the thickness of your carrots). Sprinkle with fresh chopped parsley and serve immediately.